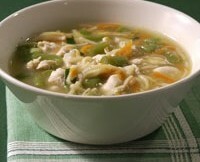 Ward off a winter cold with some delicious Chicken Noodle Soup in this quick and easy recipe. In a small saucepan, bring chicken broth and 1/4 cup water to a boil. Add garlic, noodles, and beans. Reduce heat; simmer 5 minutes. Add carrot and chicken; simmer until chicken is cooked through, about 3 minutes. Remove from heat; stir in scallion. Season with salt and pepper.